My younger son came down to visit this weekend, and we got to talking about cults. I'm not sure what brought the topic up; with the two of us, odd discussions don't take much in the way of impetus. Our conversations run the gamut, from art to music to quantum physics to politics to how to grow vegetables. But after a while, he asked, "So, have you heard about the guy who is the Russian answer to Jesus?" I said that I'd heard of the Australian Jesus, but I must have missed the memo about the Russian one. In fact, I was rather surprised that there were multiple Jesi out there. You'd think that there'd only be one at a time, considering who he supposedly is. But my son said that yes, there was a Russian one, and he was one interesting dude. So he proceeded to tell me about Vissarion, born Sergey Anatolyevich Torop, who was a soldier in the Soviet army, and later a patrol officer, before having a vision in 1990 and realizing that he was the reincarnation of Jesus (the original one). He wrote something called The Last Testament of Christ, which seems to combine New Age ideas with Christianity and various stuff from out in left field (his teachings include bits about aliens and spaceships, for example). Then he went out into the Siberian taiga, near the village of Petropavlovka, and started a settlement called Tiberkul which he set up to run on the principles of his sect. Vissarion has a great eye for natural beauty. The region around Petropavlovka is gorgeous. Although it should be mentioned that it was August -- I doubt it'd be that inviting in January. The inhabitants of Tiberkul are... interesting. They seemed intelligent, articulate, and (as far as you could tell) happy enough. The teenage boy that was interviewed had a kind of stunned look on his face -- the sort of expression you'd expect from someone who had been indoctrinated and was more-or-less petrified that he'd say something wrong and get in trouble. But everyone else seemed pretty content. That said, they seem to embrace whole-heartedly the traditional gender roles. It's hard for me to imagine any woman hearing the speech from the matronly woman near the beginning of the film, about how women need to be trained to know how to care properly for a man, and not backing away mighty fast. Vissarion himself -- who granted an interview at the end, in what is the most interesting part of the film -- definitely needs to work on his quasi-religious doublespeak. When he was asked, "What is your favorite food?" and answered, "I do not know how to phrase an answer in such a way that you could understand," I thought, "How hard would it be to say, 'I like strawberries?'" Most of what he said had the consistency of cream-of-wheat. The interviewer, Rocco Castoro, has amazing self-control, because after twenty minutes in that place I would have been laughing out loud or else running away in terror, or possibly both. But what strikes me most is to wonder how people could make the choice to embrace this cult -- for cult it is, however innocuous it may appear at first. I cannot imagine what catastrophe in my personal life could impel me to abandon what I have and flee into the wilderness to become one of this man's adoring throng. You may be gaining a community, a sense of purpose, a feeling of connection to a higher spiritual plane; but the cost is your autonomy. You have to follow Vissarion's rules; amongst them, veganism, abstaining from alcohol, refraining from the use of money and the ownership of goods. I don't doubt that breaking any of these would result in censure, possibly expulsion from the community. And then where would you be? Can you imagine if you were cut loose, after years of belonging, after you had given away all you had, quit your job, severed your personal connections? The fear alone would keep many obedient -- which is no doubt Vissarion's intent. So they continue to have their dances and play the recorders and guitars and sing songs of praise to their Messiah. What choice do they really have? I don't know what, if anything, should be done about groups like this; ostensibly, they cause no harm. But at its basis, Vissarion is promoting a false doctrine. 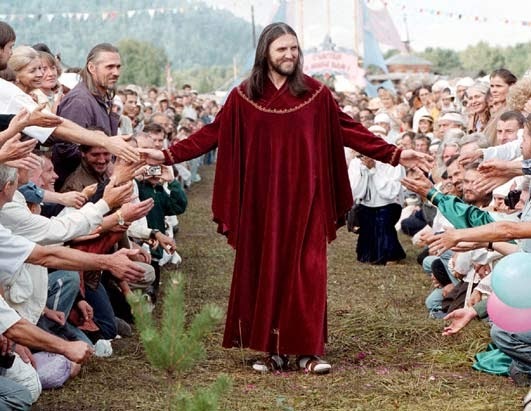 Whatever the "Russian Jesus" may be -- huckster, psychopath, guru, or some combination of the three -- he is indoctrinating these people in a counterfactual worldview, with its foolishness about alien guides and the End Times approaching. And however messy and unpleasant life in the real world can get, I don't understand anyone trading it, along with their autonomy, for a place in Vissarion's holy village. Closer to home, we have the Twelve Tribes running the Mate Factor cafe on the Ithaca Commons (and they're in dozens of other places around the world). Most of what you said about Vissarion's group applies equally well to them. You say groups like this "ostensibly cause no harm," but don't forget about the children who are brought up in communities like these, are indoctrinated from birth and receive no education that will do them any good outside the community. Also, it wouldn't surprise me if Vissarion's group isn't fond of frequent corporal punishmentfor children, as is the Twelve Tribes. The same way we are indoctrinated to survive in this materialistic society where money is the most important factor that will grant you freedom, food, pay your bills and all the loans you have accumulated throughout your life, etc...? ?